A textbook "golden cross" occurs when the 50-day simple moving average crosses above the 200-day moving average. Technically speaking this moving average crossover means that the market in question has moved into an uptrend after a longer term period of consolidation. For markets in strong long term secular uptrends (like the S&P 500) golden crosses are meaningful in the bigger picture and tend to result in higher prices 6-12 months out from the date of the bullish moving average crossover. Golden crosses in gold have also had a solid track record of success including golden crosses in February 2016 and May 2017 which saw gold prices appreciably higher a few months later. In addition, from a technical standpoint the daily-RSI(14) has pulled back to test an uptrend line drawn from the August low and Chaikin Money Flow (CMF-20) has dipped back to the zero line. These technical indicators have moderated while the gold price has corrected ~$20 from its recent high of $1300. This is the sort of action that we like to see in strong uptrends; the strongest uptrends will go through periods of consolidation and digestion in order to reset energy for the next leg higher, however, price will remain near recent highs. Gold has been resetting for the last few weeks and could be ready to retest major support/resistance between $1300 and $1310 over the next couple of weeks. 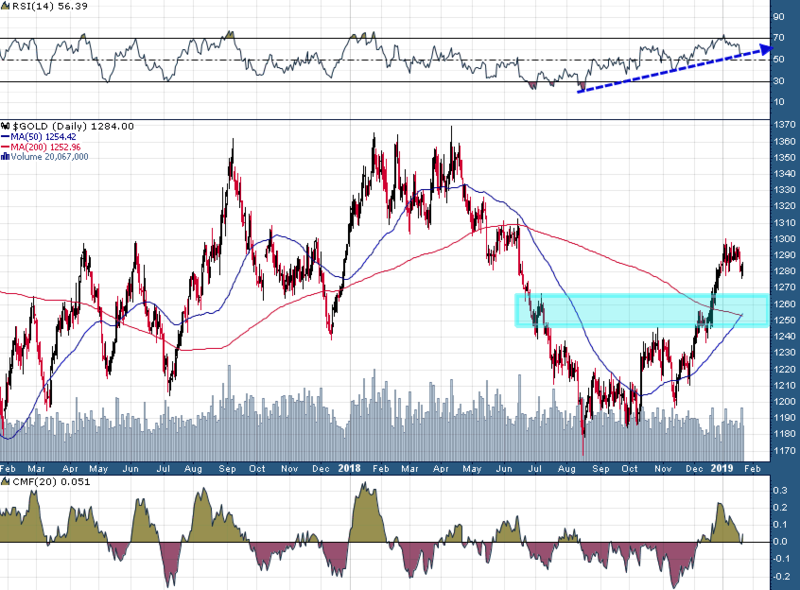 Over $1310 and we can expect gold to rally to test much bigger long term resistance up near $1350-$1370. Meanwhile, there is strong support down near $1250-$1265 (blue shaded area).